Polish Classic Cooking: "Good stuff" kielbasa from Kielbasa Factory, Inc., Rockville MD. 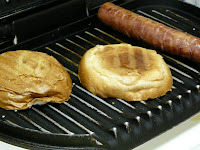 "Good stuff" kielbasa from Kielbasa Factory, Inc., Rockville MD. Witamy! 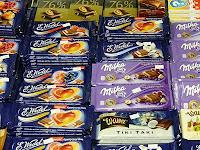 These days, one can find Polish kielbasa in almost every grocery store, butcher and meat seller in the neighborhood. BUT, there’s mass produced kielbasa and there’s “the good stuff” – and a huge difference between the two. We’ve bought the grocery store links…used it in Bigos (Hunters Stew) or grilled it over charcoal, and it’s been OK – but just OK. Given a choice, we’ll go with “the good stuff” every time. In most cases the really “good stuff,” with authentic flavors and textures just like you’d get in Poland, is found in Polish or Eastern European delis that buy their links from sausage makers that use authentic Polish recipes and sausage-making processes. 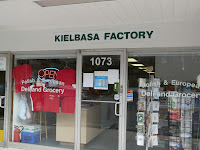 Kielbasa Factory, Inc., in Rockville MD is a clear winner for buying kielbasa (and anything else Polish for that matter). Kielbasa Factory is a deli featuring all kinds of foods and preparations imported from Poland or prepared by Poles within driving distance to the cases, shelves and coolers. From chocolates to soups, from pickles to pierogi, from dried mushrooms to beer, from cookies to cakes, and everything that’s Polish in between. Plus, there are shelves heavy with Polish pottery, glassware, books, videos, greeting cards, magazines, tee shirts, and even a baby’s bib (which we did get recently for our granddaughter that reads” Polish Princess”), and even my Mom’s iconic The Art of Polish Cooking, which is still selling well after 45 years. But this is about Kielbasa. I didn’t count, but I’ll bet they carry at least 25 different varieties. Some are more lean than others. Some have more garlic than others. Some have more herbs than others. Some are thin and some are fat. In fact, there’s even one that is heart-shaped. 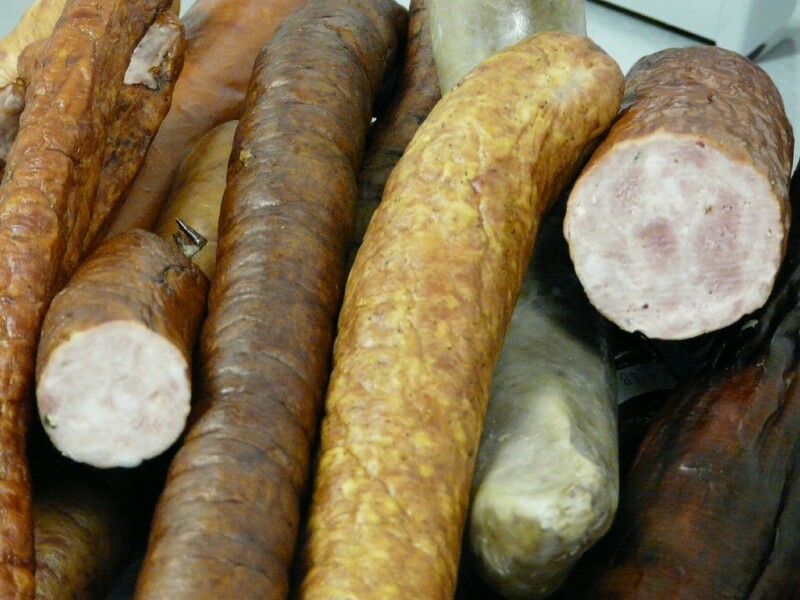 So find a Polish deli, go try a few varieties of authentic kielbasa – most delis will gladly share samples - and treat yourself to “the good stuff.” You deserve it.